A jazz vocalist with a sumptuous sound and an unerring ear for fresh and unexpected material—Illustrious fans include acid jazz-vocalist Jon Lucien (“Magnificent! She blew me away!”), jazz vocal legend, Mark Murphy (“Remarkable and very moving.”), and NEA Jazz Master Sheila Jordan (”A beautiful voice and a beautiful soul. At the top of my list of great talent. 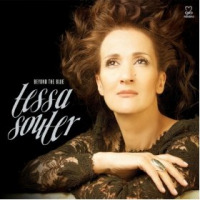 She really moves me.”)—Souter knows her way around the American Songbook’s back pages. But ever since the release of her 2004 debut, Listen Love, she has cast an increasingly wide net, from contributing original lyrics to instrumental jazz standards, and re- imagining classic British rock, to her Third Stream project, Beyond the Blue—a London Sunday Times Jazz Record of the Year, starring Steve Kuhn and featuring Souter’s original lyrics to classical gems by Albinoni, Chopin et al. Born and raised in London, Souter was making her way in the early 1990s as a freelance journalist in San Francisco—where she was one of the original six members of the storied Writer’s Grotto— when she first considered switching careers. She’s thrived since moving to New York in 1997, collaborating with an impressive roster of players. She has recorded five critically acclaimed CDs including her self-produced Flamenco-tinged debut, Listen Love (2004), Nights of Key Largo (Venus, 2008), which garnered her a prestigious Swing Journal Gold Disc Award, Obsession (Motema, 2009), Beyond the Blue (Motema-Venus, 2012), and her latest, Picture in Black and White (Noa). Utilizing the talents of some of New York's finest first-call musicians—Yotam Silberstein (guitar), Yasushi Nakamura (bass), Keita Ogawa (percussion), Adam Platt (piano), Dana Leong (cello), and Billy Drummond (cymbals and drums)—the album, the second of her recordings to make the Sunday Times’ Jazz Record of the Year list, is an emotionally resonant invitation through music to reflect on the African diaspora experience of slavery, loss, love, redemption and the pellucid and lasting repercussions of that period in history. “This album is much more than a rich collection of unusual songs, beautifully sung. It has the narrative arc of a fine short story, told with the intelligence and heart that Tessa brings to all her singing and prose- writing. Once more she has taken the endangered art of the album and mined it to its fullest,” says James Gavin, two- time recipient of ASCAP’s Deems Taylor-Virgil Thomson Award for excellent in music journalism. Another revelatory step by an artist on a decidedly unconventional path, it has already made several best of lists, including the London Sunday Times (Jazz Album of the Week and Top Ten Jazz Record of the Year), the London Evening Standard (Jazz Album of the Week) and Best Vocal Disc of 2018 (WVCR 88.8 FM). All About Jazz musician pages are maintained by musicians, publicists and trusted members like you. Interested? 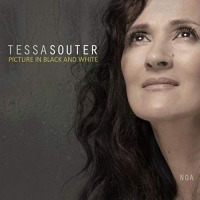 Tell us why you would like to improve the Tessa Souter musician page.